The BSE Sensex closed 10.08 points, or 0.03%, down at 34,431.97, while the Nifty 50 ended 6.15 points, or 0.06%, lower at 10,380.45. Outperforming the benchmark, the BSE mid and small cap indices rose 1.10% and 1.09%, respectively.Among the sectoral indices on BSE, capital goods and realty gained over 2%. Basic materials, industrials, consumer durables and metal rose between 1% to 1.7%. 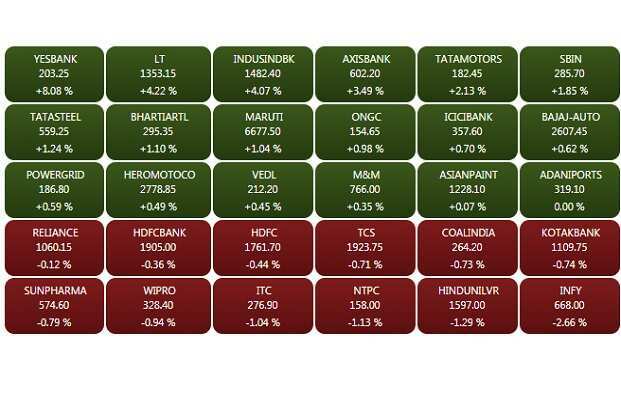 On the other hand, IT and teck led losses and were down over 1.5%.Yes Bank, Axis Bank, L&T, Hindalco and BPCL were among the major gainers on the key indices, whereas Infosys, HCL Tech, Coal India and NTPC were among the top losers.“The recent steps to ease liquidity situation by the RBI has certainly improved the sentiment but sustainability of this rebound is still questionable. We reiterate our caution view on markets and suggest using further bounce to reduce leveraged positions,” Jayant Manglik, President, Religare Broking Ltd.
Housing Development Finance Corporation Ltd reported a net profit after tax of Rs 2,467 crore int he quarter ended September 30, compared to a profit of Rs 1,978 crore last year. Reuters consensus forecast for the quarter’s profit was Rs 2,433 crore. Total revenue from operations rose to Rs 11,246 crore in the September quarter, compared to Rs 9,003 crore in the same period last year. HDFC shares surged to a high of Rs 1,795.75 per share, but soon erased gains and traded 0.48% down at Rs 1,761 per share. 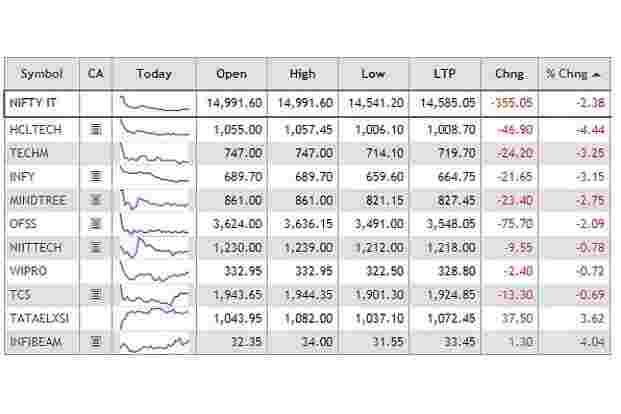 Shares of IT companies traded lower with the Nifty IT index falling over 2%. HCL Tech, Tech Mahindra and Infosys were leading losses. 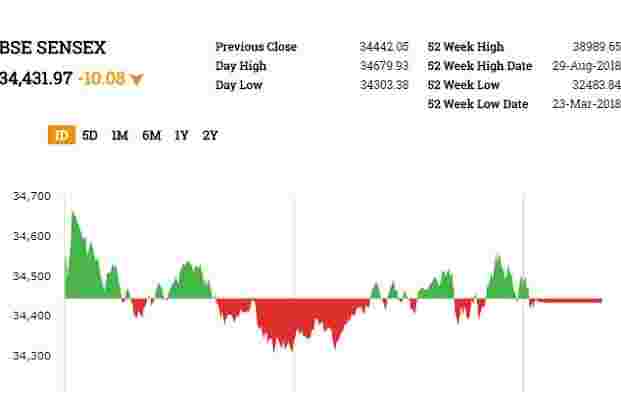 The BSE Sensex rose 77.30 points, or 0.22%, to 34,519.35, while the Nifty 50 gained 14.90 points, or 0.14%, to 10,401.50. The BSE MidCap and SmallCap indices advanced 1.18% and 1.40%, respectively.Among the sectoral indices on BSE, capital goods rose most at 3.56% followed by industrials and realty, which gained 2.5%. IT and teck led losses and were down over 1.5%. Shares of Kalpataru Power Transmission Ltd rose 10% to Rs 354.10 after the company reported a 28% jump in net profit to Rs 91.37 crore in September quarter. Revenue rose 29% to Rs 1574 crore. MAS Financial Services Ltd reported a profit of Rs 34.58 crore in the quarter ended September 30, compared to a profit of Rs 24.31 crore a year ago. Revenue from operations stood at Rs 134 crore in the September quarter, compared to Rs 117 crore in the same period last year. The company has also declared an interim dividend of Rs 1.5 per share. MAS Financial shares rose 4.5% to Rs 469.10 per share. Shares of Shriram EPC Ltd surged 17.27% to Rs 12.90 per share after the company said it has got order worth Rs 236 crore from the Jharkhand government. Maruti Suzuki India Ltd reported October total sales of 146,766 units versus 146,446 units last year. October total domestic sales came in at 138,100 units versus 136,000 units last year. October passenger cars sales rose to 101,516 units versus 99,077 units last year. October export sales grew to 8,666 units versus 10,446 vehicles last year. Shares traded 1.64% up at Rs 6,717.10 per share. Shares of Jet Airways India Ltd fell as much as 3.73% to Rs 214 after the company said it got notices from some aircraft leasing companies for delays and defaults on rental payments. The stock recovered later and traded 0.22% down at Rs 221.80. Shares of Indusind Bank Ltd fell as much as 1.89% to Rs 1,397.40 after the bank said it has Rs 3,000 crore loans outstanding to a distressed infrastructure company and its units. As on date, all loans to the group are classified as Standard Accounts, the bank said without naming the borrower. Tata Motors shares rose as much as 2.63% to Rs 183.35 per share. Tata Motors reported a net loss of ₹1,009.49 crore in the three months through September, compared with a year earlier net profit of ₹2,502 crore. It is the company’s second quarterly loss in three years, since a ₹1,902 crore loss in the June quarter. L&T shares jumped as much as 5.8% to Rs 1374.70 per share. Larsen & Toubro Ltd posted a 22.6% jump in Sept-quarter net profit, underpinned by higher order intake. Net profit came in at Rs2,230 crore in the second quarter, compared with Rs1,820 crore a year earlier. Analysts on average had expected the Mumbai-headquartered company to post a net profit of Rs1,719 crore, according to Refinitiv Eikon data. The rupee strengthened marginally against the US dollar on Thursday as Asian currencies gained after crude oil prices eased on lingering supply concerns and a stronger dollar. At 9.08am, the home currency was trading at 73.85 a dollar, up 0.12% from its Wednesday’s close of 73.96. The currency opened at 73.89 a dollar. The 10-year gilt yield stood at 7.828% from its previous close of 7.853%. So far this year, the rupee has declined 13.5%, while foreign investors have sold $5.70 billion and $8.37 billion in the equity and debt markets, respectively.